Myself and many others have played this game in earlier builds or on the RU client. Experimenting, making mistakes (Lots of them) and leaving characters behind. More importantly, we’ve figured things out for the NA/EU launch of the game. This checklist will cover things you’ll want to do to each week up to your God Form quest (30,560 prestige). It’s still something you’ll want to do just as much after you get your God Form, there will just be more things adding to that (Such as Tactical Sense). 1. Get your Sparks of Insight. 2. Pick up your Class Sparks. 3. Acquire Particles of Mastery. 4. Get your 6 adepts, keep the good ones and remove the rest. 5. Get your okki tablets, founders rings and silver pommels. 6. Send your adepts on missions and waste very little time doing it. 7. Earn credits by looting items to dissemble and earn holy texts to use or sell. 8. Get better equipment. And have a new set for the next week, always stay ahead. 9. Pick up sparks of transformation if you are low on them. 10. 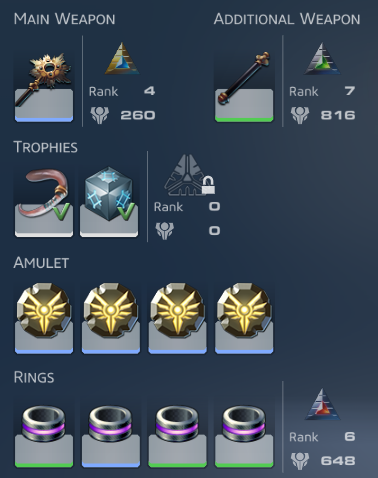 If you don’t have all 4 amulet slots, go get Ether crystals. 1. Sparks of Insight – These are rewards from completing adventures. This currency is used to progress the Upper Ascension Atlas to get to new classes and new passive talents that can be used on any class (Symbols). The Sparks of Insight on the Upper Ascension Atlas also unlock Proficiency, Greatness and Ether Slots. Best way to get Sparks of Insight? Completing Squad Missions is the fastest way. Note the reward multiplier for Normal Missions is the same as the reward multiplier for Hard, Very Hard and Impossible. Easy Missions will have a small penalty to the reward and Very Easy will have a larger penalty to the reward (0% to 50% of the reward). Hitting this limit is known as your “Soft Cap”, as most of your progression lines stop when you hit this limit. – Proficiency is gained from Red and Green nodes. This allows you to equip better gear. – Greatness is gained from the Blue “Cube” looking nodes. This allows you to upgrade your cult temples. – Ether slots only require that you reach them to unlock them. This allows you to upgrade specific core stats. – New Classes will need Sparks of Transformation to unlock when you reach them. 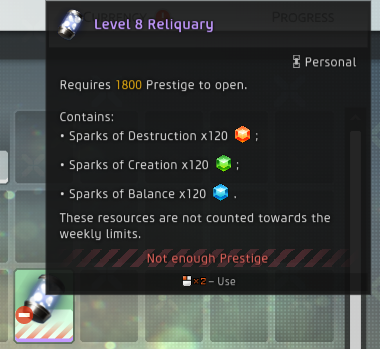 You also get Sparks of Insight from your One-time login rewards and Reliquary that do not count towards the weekly limit. 2. 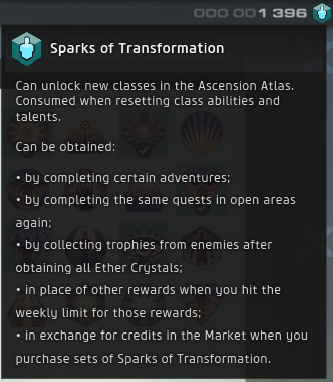 Class Sparks – When you first unlock the upper atlas by reaching the class icon on the class atlas, you will unlock earning class sparks. Class Sparks of Wildcard Sparks (Sparks of Evolution) are needed to max out the Class Atlas of a class (Learn all Abilities and Talents). Maxing out a class will unlock 2 additional symbol slots and the Class’s unique symbol. The Best Way to get Class Sparks – Killing bosses in Squad Missions. If you really need Class Sparks fast, hitting the first boss of Port Naori or Kyris can be done in 40-70 seconds for 15-25 sparks per run (+50% if you have spark replicators and +50% if you have premium). – All PvP bags from wins or losses will yield Sparks of Evolution. – All 5 man dungeons will yield Sparks of Evolution with the majority from bosses. – Squad Missions such as Nedder Test Area also yield Sparks of Evolution after completing the adventure. – x2 Class Promotion Missions will yield Sparks of Evolution. You could power farm these sparks by clearing the first boss or two and resetting the adventure by leaving with F11. 3. Particles of Mastery – This currency allows you to upgrade the maximum rank of your equipment ornaments. The best way to get Particles of Mastery? Getting A or S rank on any squad mission. Also winning or having a high losing score will get you a large amount of Mastery Particles in PvP. Completing all of the quests in a region gets you a large amount of Mastery Particles but is slower overall. – Tank mains and support mains want to upgrade their offhand because shields scale with health. – DPS mains want to upgrade their rings because it gives them the largest DPS per Particle ratio. – Might proficiency is coming later on NA/EU, until then Might is not something to take over your core stats. – Increasing the minimum rank of gear becomes extremely cost inefficient after rank 5. 4. 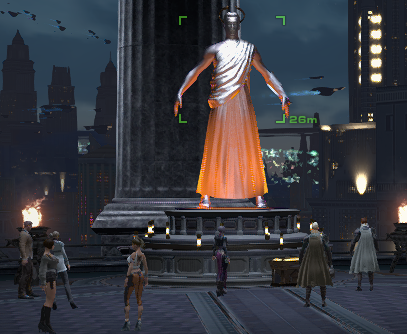 New Adepts – Go to your statue! You have new cult members to initiate. – Every day you get 6 new Adepts at your statue. Take any that have high stats (favoring Preachers early on and Templars later on) and give the rest a Punch Party. I mean…make them into missionaries. – At the very start aim for adepts that have at least 7/10 total stats or at least 4-5 in one stat. – Don’t forget your chest of follower gifts that can be claimed each day. 5. 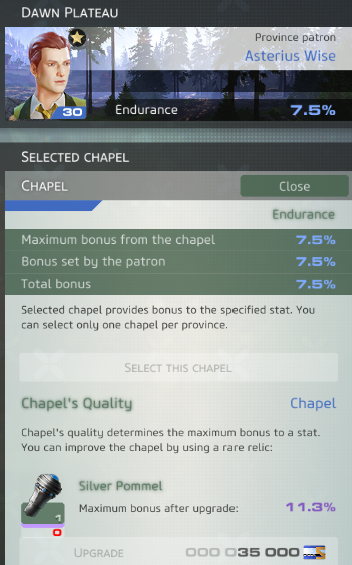 Chapel Progression – This is not to be confused with the Cult Mission system or temples upgrades, this considered a different line of progression altogether. – If you have enough prestige, you will see Okki Tablets (Green), Founder Rings (Blue) and Silver Pommels (Purple) appear on Adventures as bonus rewards. – Tablets/Rings/Pommels do not have a minimum difficulty ratio requirement. This means a very very easy difficulty that doesn’t yield end-of-mission rewards will still yield the bonus order material. – Okki Tablets (Green) and Founder Rings (Blue) will appear as a bonus every 2 days. Silver Pommels will appear on missions every 3 days. – Tablets/Rings/Pommels also have a catchup system. If you miss picking them up, new ones will reappear as bonuses when you earn them or after the daily reset until you are caught up. – To get a chapel running, you must have a temple, adept and chapel of equal or greater quality. For example, a blue chapel requires at least a blue adept, blue temple and blue chapel. – Temples and Chapels each need a Tablet/Ring/Pommel to upgrade. So 8 purple chapels will need 8 purple adepts, 16 Okki Tablets, 16 Founder Rings and 16 Silver Pommels. 6. 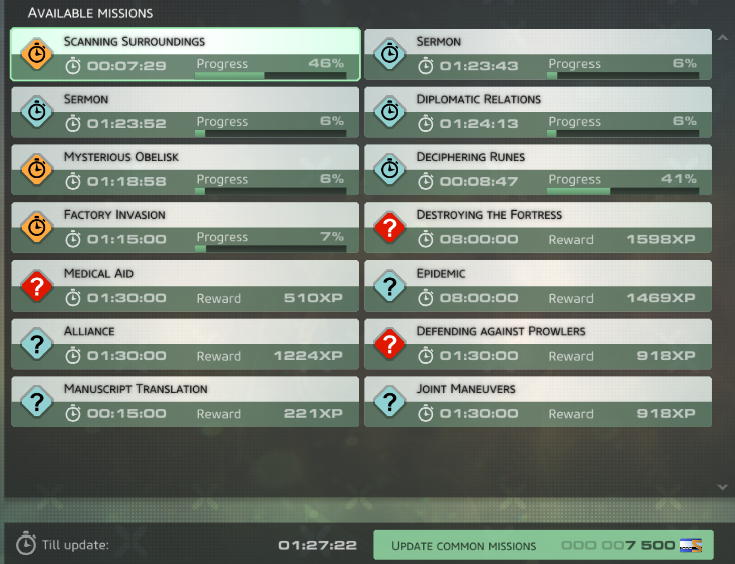 Order Mission System – Just a few minutes of attention. Fire and Forget. – Note: If you are using argents and rushing missions to build high level temples, please note that a DPS main will lose effectiveness in PvP and in PvE 5 man dungeons when the Prestige scaling patch is active. – Your cult level and resources will overflow with time even if you do not put any credits into rushing missions. – Ignore 8 hour missions unless you plan on sleeping or taking a long enough break from the game. – Just do all of the 1 hour 30 minute missions that your adepts can go on. If you want to rush the 15 minute missions, they’ll only cost 750 credits. Using this strategy you can consistently level your order without spending more than 10 total minutes per day (just updating it 2-3 times a day when you play). – Yellow Missions give you “Mission Resources” to run Blue and Red Missions. – Blue Missions give you “Followers” to Level up your cult and “Enlightenment Resources” to upgrade your adepts. – Red Missions give you “Gifts”, which are required with Holy Texts to level up your Temples. – It’s not necessary to farm Squad Missions for “Mission Resources” as long as you just run Yellow Order Missions. – This Cult guide may seem like a passive way to approach order missions, but the Cult is designed to be fire and forget and something that requires your attention..but not for long. – You don’t farm credits in Skyforge. You farm items that have a credit value. This extends your credit cap because the credits that items take away from your cap is smaller than the sell value of these items. If you loot 400 credits, that’s 400 credits that are taken away from the credits cap. – Holy Texts take 500 credits away from your cap but sell for over 1000 credits. These are absolutely necessary for upgrading your temples, especially if you plan on being a Support Main or Tank Main. Even if you don’t use Holy Texts for temples you can sell them for more credits than they take away from your cap! – Looting item boxes from bosses and some random mob kills will yield enhancement stones through dissembling them. 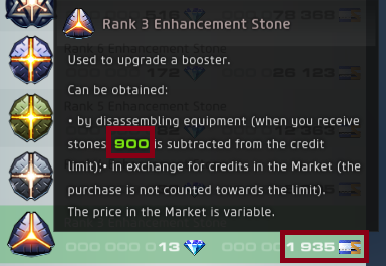 The value the stones take away from your credit cap is less than the sell cost of these stones to the market. – The ether core system is being updated. The ratio of earned vs purchased cores comes out neutralish, so if you are stretching your credit limit, earning texts and stones then buying cores from the market will be a more efficient method then getting cores directly. – Unlocking Ether Cores are capped by your insight spark limit but your credits determine the amount you can improve an ether core. – These farming methods will drastically increase the time it takes to hit the credits cap but can increase this cap from 40 to 120% of what it is. – A fairly decent amount of prestige is gained by getting a weapon, offhand and rings close to your current proficiency level. – If you aren’t farming up to date equipment, you aren’t getting the full value from your red and green nodes on the upper atlas. – Rings need to be the same two stats and they have random secondary effects. Because of these reasons, it’ll take longer to get a solid set of new rings. – If you farm a set of equipment above your current proficiency and hold onto them, you’ll be able to swap to the updated set while farming the next set. This allows you to stay optimal and ready for the next week. – Trophies are available when you unlock Veines (Region Zone). These are collected and converted into trophies in a 100:1 ratio. Trophies dissemble to pieces of the higher quality version. Purple pieces dissemble to 10 Blue, Blue pieces dissemble to 10 Green, Green pieces dissemble to 10 Grey and Grey pieces dissemble to threads. – These are needed to change your build and unlock classes. You get 500 in your “classes” intro guide but when these are gone, you’ll notice yourself needing a bunch of these. – The best place to get Sparks of Transformation is re-running the Dankit Island Region Quests. This will yield 30 sparks of transformation (45 for premium) in just minutes. This can be rerun as long as you fully finish the quests. – You can also get them via squad missions when your insight spark limit is hit. – Unlocking Naori Island will unlock your first Amulet slot. – 300 Ether Crystals (100 per slot) will unlock your other 3 amulet slots. – You have to fight enemies of relatively even prestige to get Ether Crystals. x4 enemies have a chance to drop 3-4, Regular Enemies (Sword, Shield, Eye) have a chance to drop 1 and Pack Enemies have a reduced chance to drop 1. – Killing x4 mobs is a fast way to farm Ether Crystals, although the speed and accessibility of aoeing pack enemies (especially pack enemies with a regular enemy inside) can be faster for a lot of classes. The drawback is you’ll be looting a lot of 1:1 ratio credits that way.